I can't tell you how many times my non-teacher friends ask me things like, "Why do you go to school on the weekend?" or "It's summer. Why are you reading THAT book?" Honestly?? Because I want to be all that I can be! I want to be a super teacher! I want to be GREAT! The question is: Do You Want to Be GREAT? 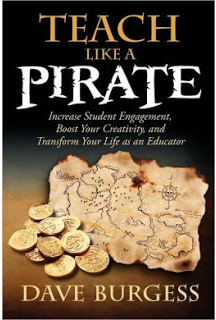 Dave Burgess hits it on the head in Teach Like a Pirate. That's a really awkward question. Do YOU...want to be...GREAT??? Hard question to answer, isn't it? What he's asking is "Do you want to be a great teacher?" Does that question make you uncomfortable? Are the people around you rolling eyes and mumbling under their breath? Or, do you just think it's selfish to want greatness? Maybe you don't want to be the overachiever teacher, the one who stays past the bell? Maybe there's too much peer pressure dragging you back to the pit of negativity? Well, Dave tells us in Pirate how mediocrity leads to nothing. And, if you are leading a group of children, it doesn't motivate, either. Why would we want to do that to our students? then we aren't "doing our part to shape the minds of future generations"
and ultimately, change the world! Y'all, we've been given a gift! One I don't take lightly. If you were an attorney, wouldn't you want to be the best one in town? If you were an author, wouldn't you want to be a best seller? Then why wouldn't you want to be a Super Hero Teacher? It's okay to aspire to greatness, especially when that greatness leads children to the love of language and words and books and... I could go on! Dave uses the story of The Little Drummer Boy as a perfect example of using our gifts. This small child had nothing of material worth to give his king. So he played his drum with all his heart. He used his gifts and shared his greatness. Dave Burgess tells us to "Play our drum for all its worth!" Get your sticks ready, my friends!